Carpenter, Welder, Wireman, Electrician, Mechanic Diesel and Painter etc. Mode of application is online for this ECR ITI Apprentices Jobs. Online applications for this ECR ITI Apprentices website is http://www.recruitmentweb.org/. Total available Apprenticeship Training jobs in East Central Railway Recruitment are 2234. Last date for submission application for these ITI Apprenticeship Training jobs of East Central Railway is 10-01-2019. Candidates must have qualified ITI in respective field for applying this apprenticeship Training Jobs recruitment of East Central Railway. Candidate's selection for this ECR ITI Apprentices Jobs Recruitment 2018 will be based on merit in 10th class and ITI marks. 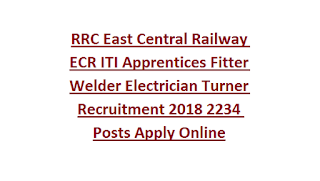 More information related to these COPA Fitter Welder Electrician Turner Wireman East Central Railway Apprenticeship Training Recruitment 2018 Notification Division wise vacancies, application procedure and other details are given below. 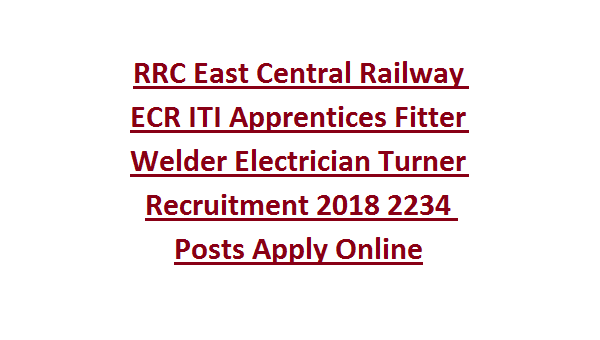 There are total 432 posts in this East Central Railway Apprenticeship Training recruitment 2018 of Fitter Electronics Mechanic Welder Electrician Trades. Age limits are 15-24 years for this ECR ITI Apprenticeship Training Vacancy as on 11-12-2018. 5 years relaxation for SC/ST and 3 years for OBC candidates. As per the ECR Apprenticeship Norms based on Apprenticeship Act. Candidates selection will be based 10th class and ITI marks percentage.